One very surprising thing about the Krita is that many users are actually running Gnome. 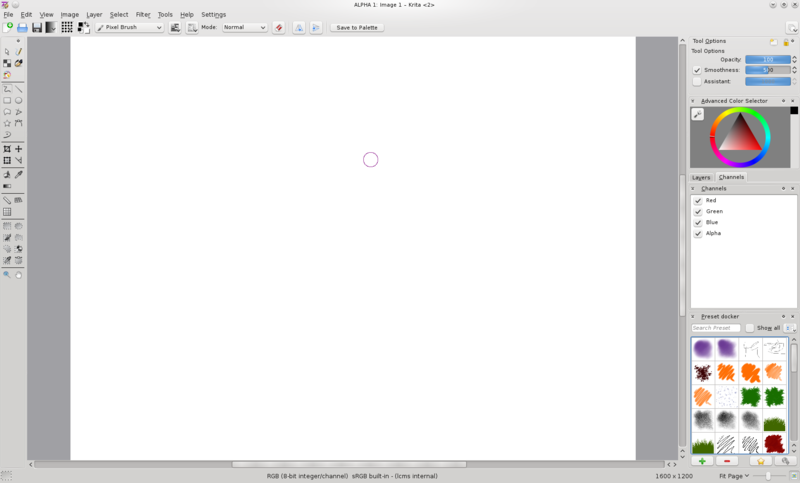 There are no exact numbers, but my impression is that there are at least as many Gnome users as there are KDE Plasma workspace users running Krita. After all the discussion in the recent time I think that the users are already much further than the distributions. KDE applications can work and look good under Gnome, but it still requires too much manual fine-tuning to get the best result. I did a bit more cleanup in the toolbox, where I removed some of the tools that are no longer needed. For example the instead of having on path tool for vector graphics and for raster graphics, we now have just one tool that can switch between the the two based on the context. In the toolbar the there are now two new functions. The first is that we now have the control for the horizontal and vertical mirror modes in the toolbar, so they work globally across different tools. The modes were added by Lukáš for 2.4 and allow to mirror the current brush painting around one or two axis. It turned out that this feature is quite popular and already produced some very cool results. The only missing part are some good icons for it. 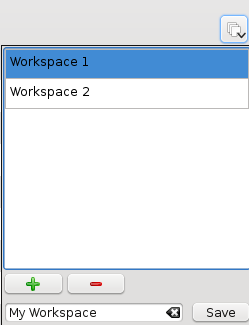 The other new feature in the toolbar is the workspace chooser, which allows to create and switch between workspace. Since Krita has lots of different dockers, which can either be docked or floating, it can be hard to manage them. An artist might want to use different docker arrangements for painting, layer management or vector graphics, so the workspace chooser allows to save a docker configuration. In the future it might also be possible to save other properties of the environment like the active tool, brush engine, pattern or gradient. It’s not completely clear which properties would be useful, so for now I only saved the docker state. We also thought about a possibility to save it to the current file so that it would be possible to always have the same workspace when working on a certain image, like it’s already done in Blender. Finally we improved the dockers a bit. I have added a new channel docker that allows to switch on and of channels. Currently it still very simple and doesn’t have the full funtionality that other applications provide yet. Below the channel docker you can see the new preset docker that was added by Adam for 2.4 and provides the same functionality that 2.3 has in the preset popup now also in a docker. By the way: The presets in the docker are from the first user-made preset collection. You are currently browsing the Sven's Blog blog archives for February, 2011.